Posted: February 15, 2011 1:55 a.m. Updated: February 15, 2011 1:55 a.m.
Jill Stephens, right, owner of Labels SCV, dances with Bedford Park bass guitarist Wendy Hersh as the band performs as a special Valentine’s Day treat for shoppers at the Promenade Shopping Center in Valencia on Monday. Labels SCV sells new and “re-newed” designer clothing. The band Bedford Park performs outside Labels SCV, a designer clothing store, as a Valentine’s Day treat for shoppers at the Promenade Shopping Center in Valencia on Monday. From left, band members Joe Iaquinto, Kenny Cetera and Wendy Hersh perform “Stand By Me,” originally performed by Ben E. King. 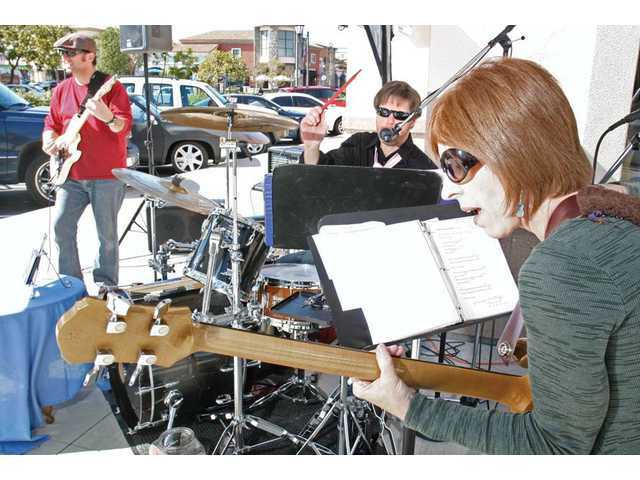 The band Bedford Park performed outside Labels SCV, a designer clothing store, as a Valentine’s Day treat for shoppers at the Promenade Shopping Center in Valencia on Monday.